YKL-40, also known as human cartilage glycoprotein 39, is a member of the “mammalian chitinase-like proteins”, but lacking of chitinase activity. Increased variations in serum concentrations are associated with inflammatory processes and several types of cancer. In this study we evaluated serum YKL-40 levels in healthy controls and in women with benign and malignant breast tumors. YKL-40 serum levels were measured by enzyme-linked immunosorbent assay – ELISA in 32 patients. The effect of the various factors was analyzed using correlation and regression analyses simultaneously determining the size and direction of correlation. The level of statistical significance of null hypothesis was P<0.05. Our study showed that serum YKL-40 level in breast carcinoma was significantly higher than the concentration in healthy controls (p<0.01). The changes in protein levels were higher than 25%. Serum YKL-40 increased with age (rxy=0.46). The correlation between glycoprotein quantity and age was positive, but feeble. This investigation is first in Bulgaria to demonstrate significantly elevated serum YKL-40 level in breast carcinoma compared to women with benign breast tumors and healthy controls. Longitudinal studies are needed to confirm YKL-40 as a potential and reliable biomarker. Key words: YKL-40, ELISA, breast tumor. Please cite this article as: Kazakova M, Deneva T, Uzunova V, Sarafian V. YKL-40 IN SERA OF BREAST TUMOR PATIENTS. J of IMAB. 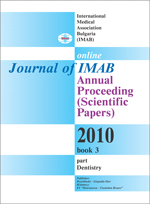 2010; 16(3):3-7. doi: 10.5272/jimab.1632010_3-7. 4. Hakala BE, White C, Recklies AD. Human cartilage gp-39, a major secretory product of articular chondrocytes and synovial cells, is a mammalian member of a chitinase protein family. J Biol Chem, 1993; 268: 25803-25810. 5. Hogdall EVS, Johansen JS, Kjaer SK., et al. High plasma YKL-40 level in patients with ovarian cancer stage III is related to shorter survival. Oncol Rep, 2003; 10: 1535-1538. 14. Kawazaki M, Hasegawa Y, Kondo S., et al. Concentration and localization f YKL-40 in hip joint diseases. J Rheumatol, 2001; 28: 341-345. 15. Zivanovic. S, Rachov LP, Vojvodic D, Yucetie D. Human cartilage glycoprotein 39 – biomarker of joint damage in knee osteoarthritis. International Orthopaedics, 2009, 33: 1165-1170. 17. Johansen JS, Baslund B, Garbarsch C., et al. YKL-40 in giant cells and macrophages from patients with giant cell artheritis. Arthritis Rheum, 1999; 42: 2624-2630. 19. Nrjgaard C, Johansen JS, Christensen E., et al. Serum levels of YKL-40 and PIIINP as prognostic markers in patients with alcoholic liver disease. J Hepatol, 2003, 39: 179-186. 20. Johansen JS, Lottenburger T, Nielsen HJ., et al. Weekly and long-time variation in serum concentrations of YKL-40 in healthy subjects. Cancer Epidemiol Biomarkers Prev, 2008; 5: 2603:2608. 21. Johansen JS, Hryer PE, Larsen LA, et al. YKL-40 protein expression in the early developing human musculoskeletal system. J Histochem Cytochem, 2007; 55: 1213-1128. 22. Ringsholt M, Hrgdall EVS, Johansen JS., et al. YKL-40 protein expression in normal adult human tissues - an immuno­histochemical study. J Mol Hist, 2007; 38: 33–43. 26. Mohanty AK, Singh G, Paramasivam M., et al. Crystal structure of a novel regulatory 40-kDa mammary gland protein (MGP-40) secreted during involution. J Biol Chem, 2003; 278: 14451-14460. 27. Roslind A, Johansen JS. YKL-40: a novel marker shared by chronic inflammation and oncogenic transformation. Methods Mol Biol, 2009; 511: 159-184. 30. Ringsholt M, Hogdall EVS, Johansen JS., et al. YKL-40 protein expression in normal adult human tissues – an immunohistochemical study. J Mol Hist, 2007; 38: 33–43.